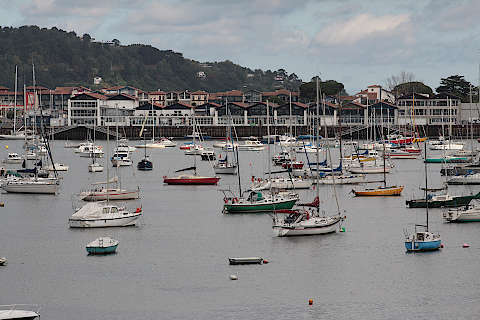 Hendaye is the last town that you come to before reaching Spain when travelling along the coast of south-west France, known as the Cote d'Argent. The town stands on the right bank of the Bidassoa river that marks the frontier with Spain. 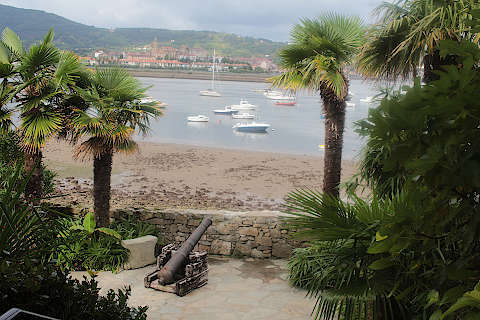 The small island in the river in Hendaye, the Ile des Faisans, was an important border location for several centuries, culminating in the Treaty of the Pyrenees being signed on the island in 1659. The Treaty finally brought to an end the centuries of conflict between France and Spain in the border regions. One curious result - the island (which is uninhabited) alternates every six months between being French territory and Spanish territory. 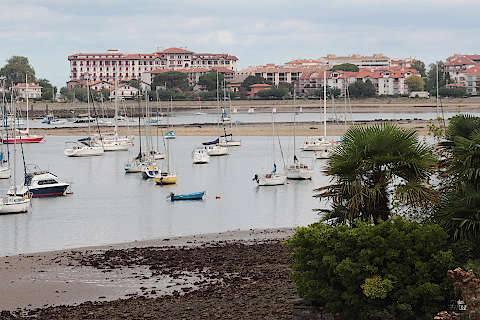 France This Way comment: Hendaye is a pleasant resort with a long sandy beach but the town is less impressive than some other resorts in the area such as Biarritz and Saint-Jean-de-Luz, so we would visit the town to explore, but would prefer to stay in one of these other resorts. 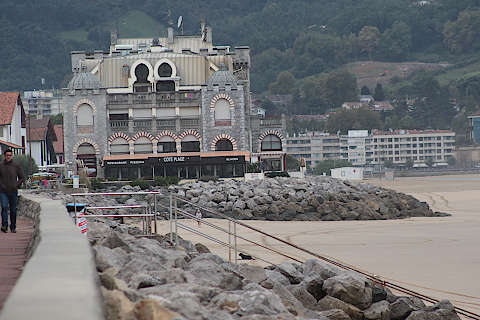 There are two separate parts to Hendaye, about two kilometres apart: the Atlantic coast area, with the beach, port and ex-casino; and the historic town to the west of the Bay of Txingudi. When you visit you will want to see both, so be prepared to drive between the two or walk quite a long way. 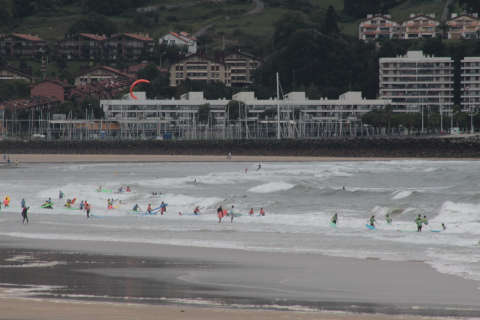 The resort part of Hendaye has a long sandy beach that is popular with sunbathers and windsurfers alike. 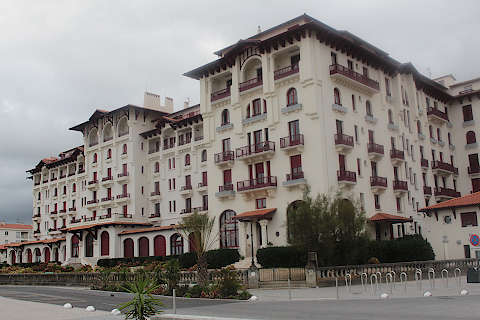 Although recent apartments tend to dominate the area behind the beach, if you explore you will also discover areas with quite a lot of belle epoque villas in this part of Hendaye. 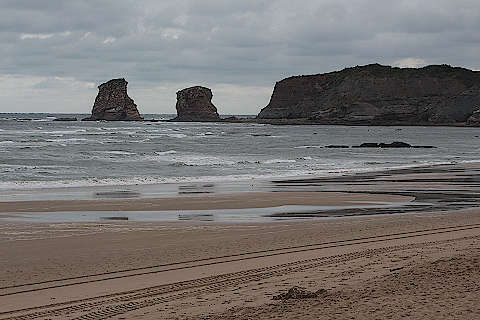 At the northern end of the beach there is a rocky promontory providing some shelter for the beach and an attractive backdrop: this headland ends with two large rocks in the water (called les Deux Jumeaux) adding interest to the setting. In the centre of the beach there is a large neo-byzantine building that dominates the beach. 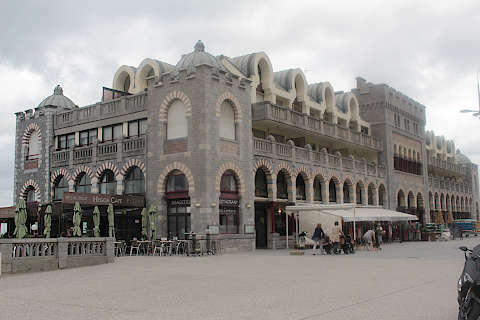 This was originally the town casino and was built in the 1860's, at the same time as the railway reached Hendaye and started bringing tourists to the town, and the same time that several of the luxury villas here were built. 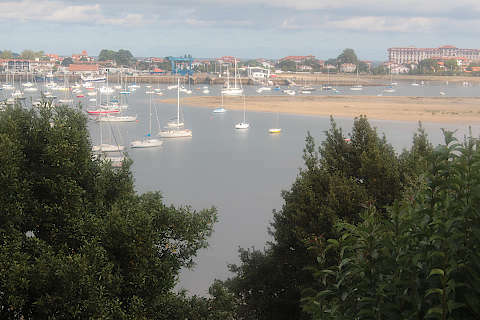 Behind the southern part of the beach in a small area in the large bay formed by the river estuary you can see the port of Hendaye, with hundreds of small boats and a pleasant place for a stroll: just keep following the Boulevard de la Mer westwards and you will find it! 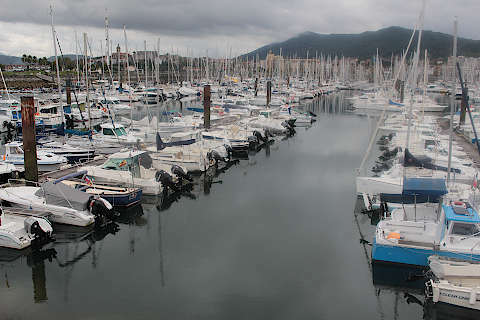 There are some features of minor historical interest in Hendaye town, as well as pleasant views across to Hondarribia. 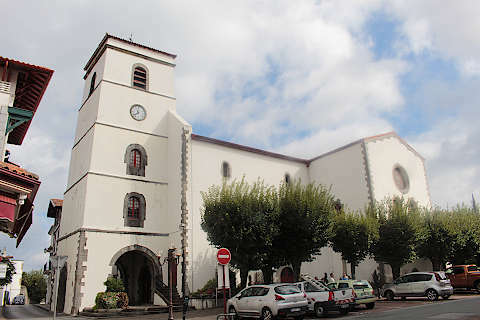 The church of Saint-Vincent, built in the 16th century, is in the centre of the town and a typical basque church, with three rows of balconies around the nave. 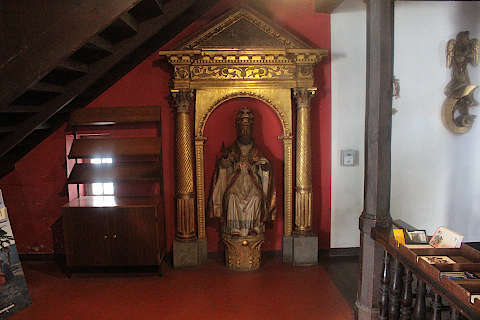 The altar and various statues are also interesting to see. 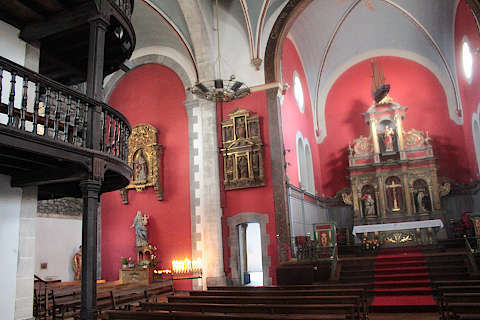 To one side of the church you can see an unusual cross dating from the 17th century. Both the Hendaye tourist information and wikipedia refer to the cross as mysterious, but neither gives any clue as to what is mysterious about it, in a guide to the Pays Basque it is described as "full of the greatest mysteries and secrets of humanity", but again no further explanation...so it remains a mystery to me! 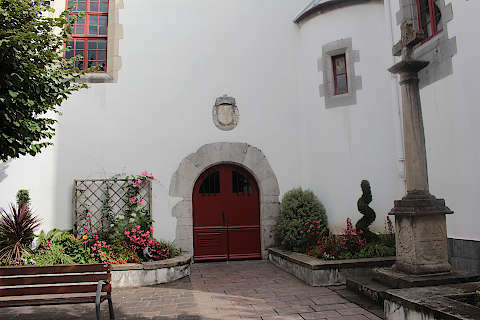 Elsewhere in the old town you can see the remains of a fortress, constructed by Vauban, and a substantial war memorial. 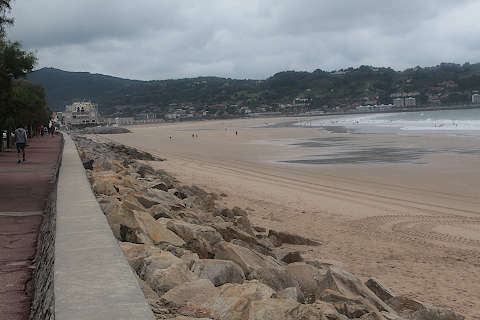 To the south of Hendaye, the easy access to Spain and the chances for cheap shopping and cheaper petrol are an attraction of the border region. 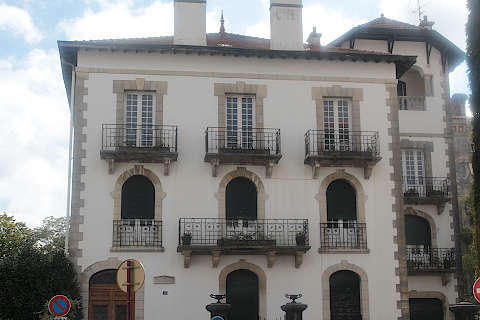 You can visit the lovely medieval town of Hondarribia while you are here. To the north the road along the coast towards Saint-Jean-de-Luz - the corniche - is very scenic: if you follow the headland north of the town centre you enter an area designated as the Abbadia Natural Park where there are some attractive cliffs and a small beach in a cove. 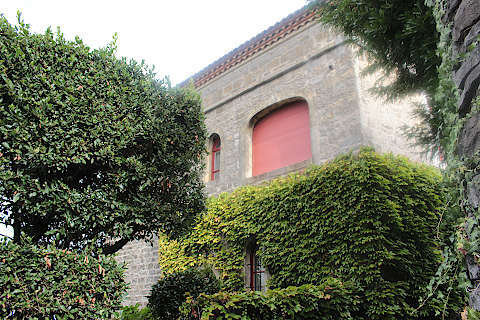 The Chateau d'Abbadia is also close to Hendaye and on the Route de la Corniche. 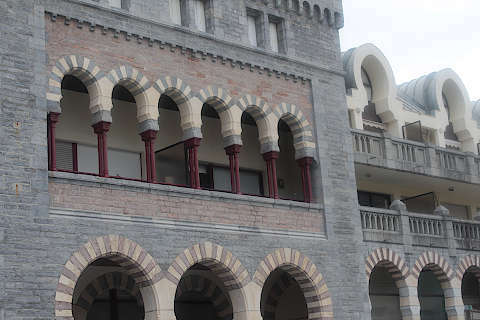 The castle was constructed in the 19th century by renowned architect Viollet-le-Duc in a 'neo-gothic' style to look medieval, and furnished throughout in an oriental style. 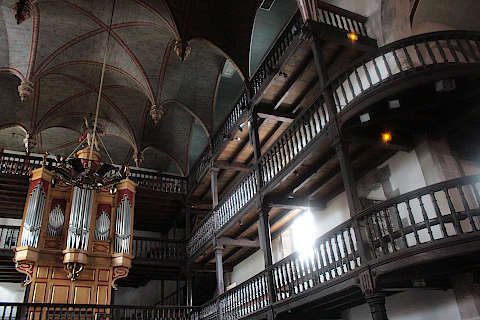 The castle also incorporates a large observatory, that can still be seen and used, and astronomy related tours and events are often available.